At less than 12" tall and 4 inch wide, The Lenovo H530s 57321111 mini-tower PC is both low-priced and compact- half the size of a standard desktop PC. With a 4th generation Intel Pentium dual core processor for performance and a variety of features and connectivity options for your convenience, it is designed for easy home entertainment but lets you do anything other than playing the latest 3D games. Haswell Intel Pentium Dual-Core G3220 processor (6 MB cache) at 3 GHz speed, 4 GB DDR3 RAM, 1 TB Hard Drive at 7200 RPM rotating speed + Lenovo Cloud Storage.. The Pentium G3220 processor at 3 GHz is similar to an i3 in terms of performance, 4GB is adequate memory for smooth multitasking and 1TB is generous space to save your songs, photos, movies and even games. Operating system is the 64 bit version of Windows 8 that you can upgrade to the newer Windows 8.1 through the online Microsoft store. It has a built-in Intel HD graphics card for decent performance in games and videos. Black Lenovo 530s has the dimensions of 11.54 x 15.74 x 3.94 inches, so it has a pretty compact casing at about 4 inch by 12 inch. The mini tower comes with quite a few expansion slots and ports for your convenience. Connectivity options include 802.11bgn wireless, DVDRW Optical drive, 4 x USB 2.0 ports, 2 x USB 3.0 ports for quickly moving data from and to other devices, HDMI port to connect to your HDTV or bigger screens, 7-in-1 media card reader, headphone/ microphone jack, a slim USB keyboard and a USB mouse.. 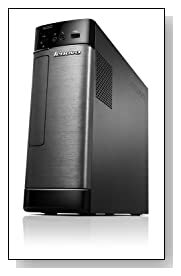 Conclusion: Lenovo H530s 57321111 is sleek, modern, nice looking and compact, but also comfortable and convenient. It has a decent processor speed so it runs fast, feels powerful and has lots of hard drive space. Sure you won't get the best performance in the latest 3D games, but it does much pretty much everything else without problems and for how much you're paying, it is a great choice for a desktop PC.